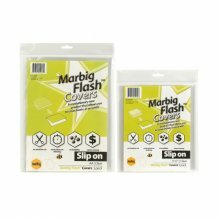 Marbig Flash book covers slip on. Protect and cover books in seconds! A better alternative to self-adhesive book covering rolls/contact - no wastage. Quick, easy and economical - no bubbles, lumps, creases, crooked edges or tearing. Pre-cut covers that slide on, with a self adhesive flap on one side to secure cover into place. Available in 2 sizes, to fit 9x7 and A4 exercise books.